Gus Hansen’s skills put the Dane in a very elite group of top tournament poker players, which he once again proved by winning yet another major live poker tournament. Friday night Hansen bested a strong final table of poker pros in London to win the Full Tilt Poker Million IX, and the $1 million, winner-take-all, cash prize that went along with the title. Hansen had to weave his way through a final table of Patrik Antonius, Howard Lederer, Seth Webber, Tony “The Lizard” Bloom, Barney Boatman, Gary Peniket, and 2010 WSOP Europe Main Event Champion James Bord on his way to the title. Hansen’s last foil was the Brit Tony Bloom, who Hansen eliminated when Bloom’s A6 failed to improve against Hansen’s A8. Unfortunately for Bloom this isn’t Lucky Ace Poker and Hansen’s A8 held up. The Full Tilt Poker Million is a shootout style tournament that saw 48 players take to the London poker tables in July; the eight winners of those preliminary heats moved on to the final table (played yesterday) with each pocketing $90,000 for their preliminary heat win. 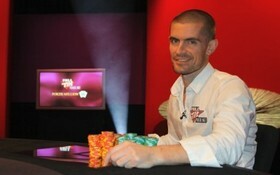 According to the Hendonmob.com’s poker database, Gus’s live tournament winnings have now surpassed the $9 million mark, putting the poker superstar in 15th place on the all-time tournament money list just ahead of recent WSOP Main Event champion Jonathan Duhamel, with TJ Cloutier the next player in line with $9.8 million in career winnings –not bad considering Hansen plays a very limited tournament schedule. This entry was posted on Sunday, December 12th, 2010 at 10:01 am and is filed under Poker News. You can follow any responses to this entry through the RSS 2.0 feed. You can leave a response, or trackback from your own site.